Turn, Turn, Turn. The Open Range Light story. I am still amazed when I recall what I witnessed the day when our first 2012 Open Range Light LF297 was picked up by its new owner. When it was time for the customer to leave we put the truck, which happened to be a Ford F150 Super Crew with a 5.5′ bed, and the trailer through a series of turning radius tests. The distance from the front cap of the fifth wheel and the rear cap of the pick up is substantial enough to allow true 90 degree turning. Take a look at Lerch RV’s YouTube video depicting that radius testing. Keep in mind that the Open Range Light is truly a half ton tow-able fifth wheel. And with the innovative front camp design and hitch pin placement, you can tow this beauty with just a standard fifth wheel hitch installed in your tow vehicle. No need for a sliding fifth wheel hitch (slider) or any other special modifications need to be made. 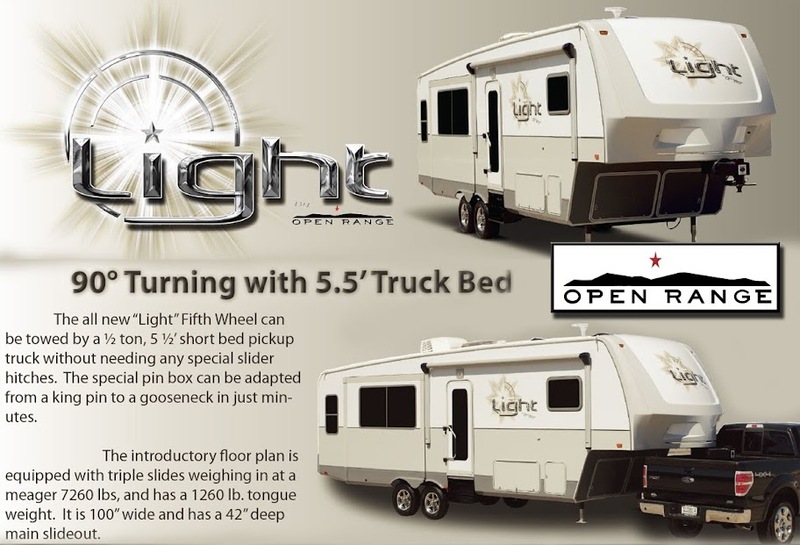 The Light is another great innovative idea from the Open Range RV company. The Light product line includes the above pictured LF297RLS, LF289RES and the LF305BHS (bunk model with outside kitchen). There is also a travel trailer in the mix as well, the LT252FLR. So if you are driving a half ton tow vehicle and are looking for a truly unique fifth wheel to camp in, look no further than the Open Range Light. And if you happen to have a 5.5′ short bed truck and want a fifth wheel camper, the Light is especially for you! You can have full size fifth wheel fun in a half ton tow-able package, without missing anything. All the features that you require in an exciting package. The Open Range Light fifth wheel campers and travel trailers are available at Pennsylvania’s largest Open Range RV Dealer, Lerch RV. Located in Milroy, which is one hour west of Harrisburg and thirty minutes southeast of State College, the home of Penn State University. For more information on the Open Range Light, please contact us. I wanted to inform my RVing friends of a recent Reese hitch recall. This recall involves certain Reese (P/N 54970) and Pro Series (P/N 63970) Weight Distribution Shanks. This recall is only for the shank of the hitch (the part that the hitch head attached to/the part that slides into your receiver on the tow vehicle) Please read the information that is provided below and please check your hitch shanks for your serial numbers. Safe travels and Happy RVing! Information about the Reese Weight Distribution Hitch Shank Recall. TD100435, TD100451,TD100456, TD100511 or TD100617. These parts were sold both individually and as a component in certain Reese and Pro Series weight distributing kits. As a result of a production error, some weight distribution shanks were not manufactured to the correct specifications. As a consequence, the shank may fracture when subjected to load during installation or use, potentially causing a crash. Please follow these instructions to determine if you own one of the recalled shanks. DO NOT CONTINUE TO USE THE SHANK. A replacement shank will be provided free of charge. charge within a reasonable time, you may submit a complaint to:  Administrator, National Highway Traffic Safety Administration, 1200 New Jersey Avenue, SE, Washington, D.C. Introducing the all new Light by the Open Range RV Company. True 90 Degree Turning with a 5.5′ Truck Bed…. Once again the innovation is just over flowing at the Open Range RV Company in Shipshewana, Indiana. The newest offering from Open Range is the triple slide-out, 31′, half ton towable – LIGHT. The all new LIGHT 5th wheel can be towed by a 1/2 ton, 5 1/2′ short bed pick up truck without needing any special slider hitch. The special pin box can be adapted from a king pin to a gooseneck in a matter of minutes. Click here to see this great interior. The introductory floor plan is equipped with triple slides, weighing in at a meager 7,260 lbs. This trailer is 31′ in length and only has a tongue weight of 1,260 lbs. Equipped with a true 42″ main slide-out and is 100″ in total width. Do not let the light weight fool you, this is a fully equipped trailer. With exciting features such as a full side aisle bath with corner wall shower and large rear living area, this product will not have you second guessing yourself. After the introductory LIGHT LF 297 RLS other floor plans are scheduled to follow. The exterior has a high-gloss metallic automotive finish. Inside you will find a clean, rich look that feels elegant. From the large 86″ sleeper sofa to the portable island that converts to a large dinette table. The LIGHT is an exciting new option in light weight 5th wheels. Oh, before I forget, this fifth wheel RV also comes washer/dryer prepped and has a bedroom wardrobe slide. This all new offering by Open Range will be available at Pennsylvania’s largest Open Range RV dealership, mid-June. For more information on this exciting new RV, please contact us at 800-722-1236. Or visit Lerch RV on Facebook. Uphill – Downhill, tips to save those RV brakes…. Mountain driving can be a bit challenging at time and it can be especially hard on your RVs brakes. You need to be extra cautious on these roads and definitely take your time. And it’s always good to know in advance exactly what your RV is capable of handling. When climbing long inclines, your RV needs to be operated within its power band. The power band is a span of engine RPM (Revolutions Per Minute) where you have the maximum horsepower available to handle the extra load imposed when going up long inclines. This becomes even more noticeable with diesel engines. Their power band is usually a rather narrow band of RPM (Revolutions Per Minute) . When operated within their assigned power band, you will have a tremendous amount of pulling power. Fall below that RPM, and it will do you no good to push harder on the throttle. All you’ll get is more black smoke coming out of the exhaust. To stay within the power band, you must downshift to a lower gear, and you may even be required to let off the throttle a bit so the engine can work more comfortably. Pushing too hard will only create more heat and increase the likelihood of overheating. The whole point when climbing long inclines is to adjust your gearing, so you will remain within the comfortable RPM range that your engine likes. Maintaining a certain speed because the sign on the side of the road says that’s the speed limit may be impossible. Slow down and use a lower gear instead. So you’ve safely crested the high point in your RV. Now it’s time to come down the other side of the hill.This is where you make your engine and transmission work to hold you back. That way, you save your brakes for when you really need them. The time to set up your downhill decent strategy is at the top of the hill — well before you’ve picked up so much speed that you’re in trouble. You only have one set of brakes. If they get too hot, they may fade away and your RV will become a runaway train — a situation rapidly headed for disaster. Experience will teach you how many gears down you need to drop from top gear in order to descend a hill without constant use of the brakes. If you’re new to steep descents, it’s best to error on the safe side by going down a hill in too low a gear. You may be slow, but at least you’ll be safe. It’s very hard to go back and have a do over, if you picked too high a gear at the top of the hill. Many diesel engines are equipped with a retarder that will help hold you back. It functions by blocking off some of the exhaust gases from your engine. This helps to keep the engine from revving too high when the weight of your RV is trying to push you down the hill. Some large diesel pusher motorhomes are also equipped with jake brakes. A jake brake is an engine-mounted device that turns some of the cylinders into an air compressor when you let your foot off the throttle. Jake brakes are a very effective way to control your descent speed without the need for constant braking. If you find yourself going downhill faster than the engine and transmission can hold you back, your braking should be done in short bursts. It’s far better to brake hard for a shorter distance than to ride the brakes for a long period of time. When you’re towing on a mountainous road, we think you should just enjoy the ride and take it nice and slow and be safe rather than sorry. Hitch up your 5th wheel and let’s roll. When heading out on the road, whether to go on your next trip, or to come back home from the trip you are on. You may find yourself just going through the motions. Sure, you may have done this many, many times before, but a simple lapse in judgment can have disastrous results. Becoming complacent at anything is dangerous. Whether making sure all your provisions are packed, to cleaning out your rig, sometimes your mind just may be somewhere else. This goes for hitching and unhitching you fifth wheel as well. The best way to get around the malaise that may occur when hitching and unhitching your fifth wheel is to make a check list for every trip. This will help you stay focused on what you need to do, without you having to wonder if you forgot anything. I found a great checklist that you can use from rvbasics.com that will help you get your fifth wheel hitched and unhitched safely and quickly. Raise or lower the 5th wheel trailer to set the 5th wheel kingpin to proper hitch height . Open locking bar on hitch. Back under trailer until hitch engages the fifth wheel kingpin. Secure hitch locking bar on the fifth wheel hitch. and ‘bump’ the hitch to make sure it is locked. Connect umbilical cord/power cord and breakaway switch cable. Check fifth wheel trailer lights and brakes. Raise 5th wheel trailer Landing gear. Remove wheel chocks from trailer wheels. Pull into the site/storage, and situate the trailer where you want it. Chock the wheels tightly so the trailer will not move. Drop the fifth wheel landing gear. (important!) Do this first so you won’t forget! Disconnect the umbilical cord and breakaway switch cable. Gently put your truck into reverse… don’t give it any fuel/acceleration. This effectively moves the 5th wheel kingpin off the locking bar which will allow you to easily disengage it. Shift in to neutral, step on brake and apply parking brake. Disengage the kingpin locking bar on fifth wheel hitch. Slowly drive away. Making sure the kingpin is clear of anything in the truck bed and the umbilical cord and breakaway cable are not snagged. Adjust 5th wheel height to proper front to back level. *Disregard this step if you have a notched fifth wheel tailgate or you do not have a tailgate. Make sure that you go over each step in the above list and make sure that everything is where it needs to be. While you may be thinking about everything you are going to do when you get to your camp site, you may forget to take care of the business at hand. Once you have everything checked off, then its on to the open road! If you have any questions about how to hitch or unhitch your fifth wheel, be sure to contact Pennsylvania’s Largest Keystone and Open Range RV Dealership and we will gladly answer any questions that you might have. I have had several customers lately ask me about the different terminology used when talking about towing. I have compiled a small list of key words and their definitions. Hopefully this helps people better understand how you can successfully tow a trailer, be it an RV, horse or utility trailer. The science behind towing is all the same. First thing to be aware of is this; Because a tow vehicle and a trailer form an articulated (hinged) vehicle, weight considerations are very important to safe towing. The tow vehicle must be a proper match for the trailer. The ball and coupler hitch is used on a wide variety of tow vehicle combination. This hitch consists simply of a ball attached to the rear of a tow vehicle and a coupler (socket) at the tip of a tongue or A-frame attached to the front of the trailer. This hitch is commonly used on recreational trailers. * Receiver: Hitch platform fitted to the tow vehicle. * Ball mount: A removable steel component that fits into the receiver. The ball and spring bars (only on load distributing hitches) are attached to it. * Sway Control: A device designed to lessen the pivoting motion between tow vehicle and trailer when a ball-type hitch is used. * Coupler: A ball socket at the front of the trailer A-frame that receives the hitch ball. * Spring Bars: Load-leveling bars used to distribute hitch weight among all axles of tow vehicle and trailer in a load distributing ball-type hitch. Perform a safety inspection before each trip: Make sure that the pin securing the ball mount to the receiver is intact, the hitch coupler is secured, spring bar hinges are tight with the safety clips in place (load equalizer or weight distributing hitches), safety chains are properly attached and the electrical plug is properly installed. Practice trailer backing: Backing a trailer into tight places is easier than it looks, but it does take some practice. It’s best to practice in a parking lot and in a vehicle that allows you to see the trailer through the rear window. Vans, trucks and campers that have obstructed rear views require more practice and the use of side mirrors. In either case, be patient, and make steering adjustments slowly and a little at a time. Watch your tongue weight: How a trailer handles down the road depends upon tongue weight. Too much weight will cause the rear of the trailer to sway and make the tow vehicle difficult to control. The tongue weight should not exceed 200 pounds for trailer up to 2,000 pounds. Tongue weight for trailers over 2,000 pounds should be 10 to 15% of the trailer’s loaded weight. Take care of tires: It’s wise to periodically check tires for wear, cuts or other damage and replace as needed. Above all, maintain the tire pressure recommended by the manufacturer, located on the tire sidewall. Improperly inflated tires will cause them to wear out quicker and reduces fuel mileage. Let us move on to some terms and abbreviations of weight that really confuse a lot of people. I tried as best as one could to keep the definitions simple and plain. Not all apply to recreational vehicle towing. However I thought it best to include as much information as I could. * Base Curb Weight – Weight of the vehicle and trailer not including cargo or any optional equipment. * Cargo Weight – Includes cargo, passengers and optional equipment. When towing, trailer tongue weight is also part of the Cargo Weight. * Gross Axle Weight (GAW) – The total weight placed on each axle (front and rear). To determine the Gross Axle Weights for your vehicle and trailer combination, take your loaded vehicle and trailer to a scale. With the trailer attached, place the front wheels of the vehicle on the scale to get the front GAW. To get the rear GAW, weigh the towing vehicle with trailer attached, but with just the four wheels of the vehicle on the scale. You get the rear GAW by subtracting the front GAW from that amount. In the absence of a scale, calculate the Front Gross Axle Weight by adding the Front Axle Curb Weight to the Cargo Weight (including passengers) assigned to the front 1/2 of the van. Calculate the Rear Gross Axle Weight by adding the Rear Axle Curb Weight to the Cargo Weight (including passengers) assigned to the rear 1/2 of the van and the Tongue Weight of the trailer. * Gross Axle Weight Rating (GAWR) – The total weight each axle (front and rear) is capable of carrying. These numbers are shown on the Safety Compliance Certification Label located inside the driver side door frame. The total load on each axle (GAW) must never exceed its GAWR. * Gross Combination Weight (GCW) – The weight of the loaded vehicle (GVW) plus the weight of the fully loaded trailer. It is the actual weight obtained when the vehicle and trailer are weighed together on a scale. * Gross Combination Weight Rating (GCWR) – The maximum allowable weight of the towing vehicle and the loaded trailer (including all cargo) that the power train can handle without risking costly damage. The measured GCW must never exceed the GCWR. (Important: The towing vehicle’s brake system is rated for safe operation at the GVWR — not GCWR. Separate functional brake systems should be used for safe control of towed vehicles and for trailer weighing more than 3,000 lbs. when loaded). * Gross Vehicle Weight (GVW) – Base Curb Weight plus actual Cargo Weight. It is the actual weight that is obtained when the fully loaded vehicle is driven onto a scale. * Gross Vehicle Weight Rating (GVWR) – The maximum allowable weight of the fully loaded vehicle (Base Curb Weight plus options plus cargo). The vehicle’s measured GVW must never exceed the GVWR. The GVWR along with other maximum safe vehicle weights, as well as tire, rim size and inflation pressure are shown on the vehicle’s Safety Compliance Certification Label. * Gross Trailer Weight – Is the highest possible weight of a fully loaded trailer the vehicle can tow. It assumes a towing vehicle with mandatory options, no cargo and the driver only (150 lbs.). The weight of additional optional equipment, cargo and hitch must be deducted from this weight. * Payload – Maximum allowable weight of cargo that the vehicle is designed to carry. It is Gross Vehicle Weight Rating minus the Base Curb Weight. Hooking Up, the right way! I have found some disturbing information from speaking to our Service Technicians. Customers often under-rate and overlook proper hitch-work. Being that this is the single most important point when towing, it’s really a good idea to understand and familiarize yourself with the right processes of connecting your trailer to your towing vehicle. Have truck, will tow… Is not a motto one should live by. All hitches have class ratings that should not be ignored. All parts of a hitch set up should be inspected periodically for damage and serviceability. If you believe something does not look right, or the trailer you are towing has all of a sudden ‘felt’ different. Please have a qualified person take a look at your hitch. Feel free to contact one of our Service Technicians at your Central PA RV Dealership. The hitch set up is not the same for every trailer, if you recently traded in your ‘old’ unit for a new RV, your hitch setup should be looked at and re-adjusted for the new coach you are going to be towing. I found the video below to be very informative and educational about hitches. Mark Polk owner of RV Education 101 http://www.RVeducation101.com offers some tips on proper hitch-work and trailer towing safety in the video above. National Highway Traffic Safety Administration (NHTSA) accident statistics available at http://www.dangeroustrailers.org, some of which make you really think. Safety should always be at the front of anyone’s mind while towing. 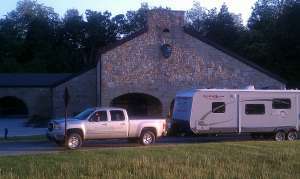 It is always nice arriving at your destination safely, ready to begin making memories while using your RV. It’s not a bad idea to practice your handiwork now and then to keep your hitching skills sharp. Also do not forget to look over your hitch before you hook up. If you need more advice or guidance on proper hitch-work, don’t hesitate to call Lerch RV.